The majority of the Curry 2 users think that the shoes are great for casual and high-performance players. The shoe has a very balanced platform, says one reviewer. Nearly all users comment that these basketball shoes from Under Armour feels very light on their feet. Most of the testers commend the consistent grip of the shoe on the floor; saying that it bites the surface really well regardless of indoor court conditions. They compared the traction to the Jordan 28 and KD 9. A lot of users say that the UA Curry Two is very comfortable. A few testers notice that the shoe doesn’t build up heat internally because the upper is thin and moisture dries very quickly. Some reviewers feel that the heel-to-toe transition is much smoother with the Curry Two than the previous model. Many of the users think that the shoe looks great. Its design is almost identical to the design of the 2018 Hyperdunk of Nike. Some users comment that the sole is not very durable and breaks down fast. Majority of the users’ complaints are about the stiff Charged midsole cushioning. There’s not much impact protection on the Curry Two, says most of the shoe’s users. One reviewer says that the shoe feels a little heavier than he’s used to. A few players comment that the traction needs some time to break in. Several users feel that without an ankle brace, the ankle support is quite flimsy. Because of the shoe’s squared toe box, some people think that it runs small despite the shoe being true to size. Overall, majority of the users enjoys playing in the Under Armour Curry Two. Most of the aspects of the shoe deliver on-court, most especially its one-to-one fit and gripping traction. If you are a player that puts prime on impact protection, the shoe’s cushion might be a little too firm. But if you don’t care too much for cushioning, then this is a shoe for you. This is a great shoe for guards and all ya'll smaller players. The Curry 2 does notthing wrong, but could do a few things better, namely support and impact protection. With the Curry Two, I have a new go to shoe that claims my top spot. Honestly, if I reach for the Curry One or Two, I am reacing for the Clutchfit Drive still. Coming out as Stephen Curry’s second signature shoe, the Under Armour Curry Two features multidirectional herringbone, Charged cushioning, and a fantastic-fitting SpeedForm upper. All of which add up to create a solid shoe. 2019 has been a big year for the release of Stephen Curry’s sixth Under Armour basketball shoe. With its overly positive reviews, some users can’t help but compare the shoe to the previous Under Armour models of the Warriors star. There are claims that the Curry 2 has better traction than the newest shoe. Cushion. Stephen Curry is said to have loved the Charged cushioning on the Curry One; thus, the second iteration also has a full-length Charged foam in the midsole. This foam technology converts impact energy into push-off energy that helps produce explosive steps. The shoe has a slightly extended outrigger that adds stability to the feet. The midsole is split into three sections for a smooth heel-to-toe transition. Traction. The Curry Two uses an organic herringbone pattern for its outsole. The lines are thick and multidirectional, ensuring a consistent grip. The shoe can be used indoors or outdoors since the grooves are quite deep. However, sticking to indoors will keep the pattern longer. Length and Width. The shoe fits true to size. You can go with your standard Under Armour Basketball size when purchasing. Lockdown. With its one-to-one fit and external TPU heel counter, the foot will not go anywhere. A rigid midfoot shank delivers locked-in stability while the wide lace holes allow the shoe to grasp the feet completely. The Curry Two’s upper uses a breathable and light constructed material called SpeedForm. This textile-like material covers the midfoot to the heel and is joined to a synthetic material on the toebox. The upper provides ample support and enough flexibility to accommodate an ankle brace. The material conforms to the foot after a couple of wears. The shoe has a TPU heel cup and midfoot shank for added stability. The UA Curry Two also has Charged cushioning in the midsole. 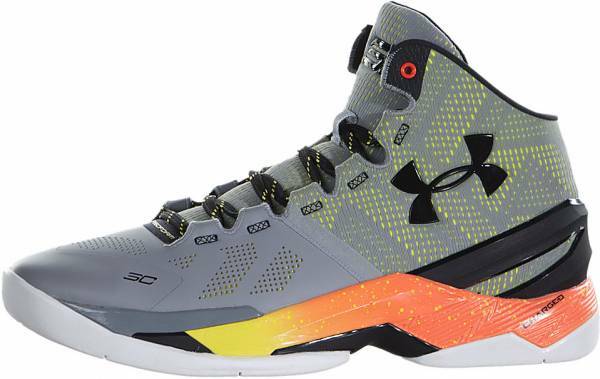 The Curry Two is considered as a mid-top that balances ankle support with the ability to have a range of motions. The shoe’s aesthetic plays on the different textures of the SpeedForm and the synthetic material. On the medial side of the heel, a phrase written in Stephen Curry’s handwriting says, “I can do all things..” Curry’s initial “SC” is embossed on the tongue and the lateral forefoot. The Under Armour logo is found on the lateral side of the shoe, the tip of the toe box, and the midfoot shank.